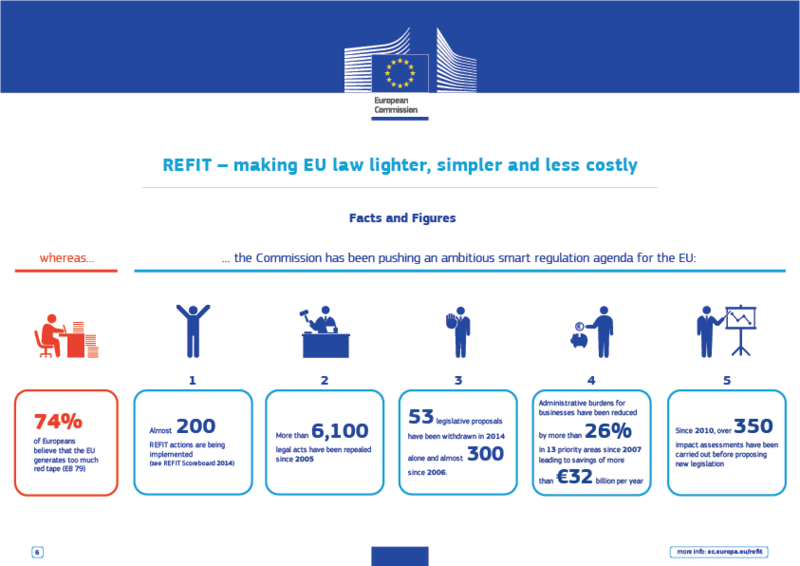 Following the “Communication on Regulatory Fitness and Performance Programme (REFIT): State of Play and Outlook” (COM (2014) 368 final), on December 16th, 2014 the Commission adopted the REFIT actions for 2015 as an annex of its Work Programme for 2015. The annex includes all REFIT actions (simplification, codification/recast, consolidation, repeal, update/review) that are planned for the Commission adoption during 2015 and all evaluations and Fitness Checks to be carried out. Since some of the pending legislative proposals from the previous Commission do not match the new Commission’ political priorities, they will be withdrawn. Some of these actions include the following policies: Migration, Home Affairs and Citizenship; Transport; Environment, Maritime Affairs and Fisheries; Internal Market, Industry, Entrepreneurship and SMEs. The Commission wants to ensure that the EU acquis is “fit for purpose” by identifying corrective actions such as: legislative initiatives to simplify and reduce regulatory burden, withdrawal of proposals without a realistic chance of adoption or where the initial objectives can no longer be achieved, evaluation and Fitness checks to assess relevance, coherence, efficiency, effectiveness of EU legislation.